Indeed. Or maybe Red will get an rrrx tile to complete his road and point one of the other roads into the gap. There's always a risk that something will go wrong. 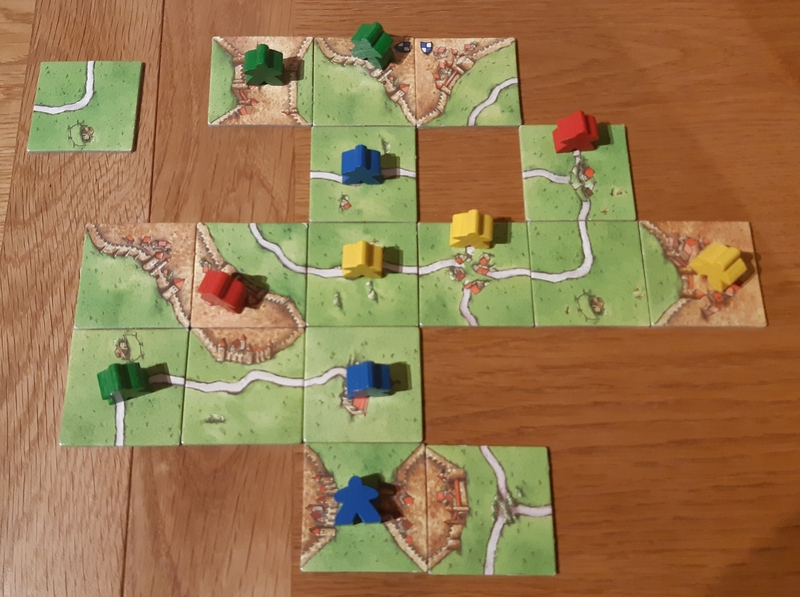 I would place to the west the board next to the uppermost of the red city tiles, place a meeple on the top city segment and hope to glom into reds city in moves ahead. I don't tend to farm until there is a completed city available. How about placing it SW of "our" cloister, and irritate green ... we can either put a farmer on it, or meeple on the easterly city. Lots of options - no concensus yet. What will Dan do, is it time for referendum? Jéré's suggestion is getting my vote! They're all good, and I reserve the right to pretend I wanted to do something different if my chosen choice would have been more successful if I'd chosen something else. Farming. Means. Farming. Even in the event of a no-city farm, if it is the will of the people then placing a farmer is the right and proper thing to do! 1 for me. Normally, I wouldn't farm this early, but in 4p game getting a likely 12 points with potential for more makes a lot of sense. Subtle difference only between 1 and 4a, so I'll stick with 4a, but would be OK if the concensus is 1. The game didn't want you to have to wait for long wolnic! Points have been scored and meeples have been trapped! has won himself 3 tasty points for a road, and was the first person to complete a city (on our farm). Our trapped meeple will be worth either 1, 2 or 5 points depending on whether we're able to join to Yellow's road. Yellow won't be keen for us to join on as this will trap a second meeple of his, but maybe this will encourage the other players to join them up instead? 1. We could seek revenge on Red for his frrr viciousness by trapping his meeple in the north-east corner. This would mean giving him 2 points for no reason other than to trap his meeple, and there's a chance someone else will do it anyway. But it's an option. 2. We could place it 2 tiles east of our cloister creating an frfr gap (or an frrr gap but I'd advise against this given the number of frfr vs. frrr tiles left in the bag) as a means of improving our chances of completing our cloister. Another nice thing about this would be that it leaves a nice 3-point road for anyone who does put a tile there, which might be us, or someone else who wants those points for themselves and doesn't mind generating a point for our cloister in the process. 3. We could start a new road from one of the existing road branches on the crrr south-east of our cloister. There are a number of other places where we could potentially claim a new road but if we're going to claim a road I'd recommend joining to this tile as our new road would already be closed at one end and could potentially form a small loop if we wanted it to. Where did the coasters go? I think I'd go for a new road below the eastern tile of the completed city making a turn to the east. In regards to option 1, let someone else seek revenge indeed (like yellow) as I don't like to give red another 2 free points. In regards to option 2, whatever is put beside that space is fine as all possibilities for that space are still in the bag, so I'm not worried yet about that. I can't think of another interesting option so I guess I'm picking option 3. Thanks oosie. The coasters are safe, but they were starting to take up a bit too much desk space. Is anyone else willing to share their insight? I have no issue with option 2 but maybe it limits things too much, so feel I'd rather agree with Oosie. If a CRFR comes our way then we might be able to sneak into Yellow's city by placing it next to the cloister, but still have the option of FRFR and FRRR tiles going there and the temptation of a 2 or 3 point road. The FRFR would leave a potential gap for another FFFF cloister - if we want to chance getting the next one? Putting the corner road tile to the south also helps keep the field open. Worth putting a follower on it?